Disclaimer: This is one of my “Not for the Faint of Heart” posts. If you fall into that category, please come back another day when I’ll be talking about pudding. 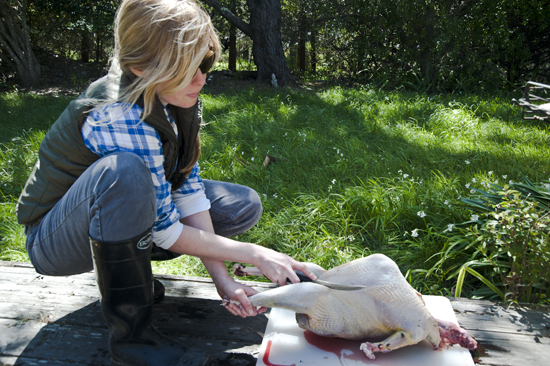 Since it is turkey season, and since I found myself with two turkeys to haul off the field not too long ago, I thought I’d show anyone venturing out this spring how I field dress and butcher a turkey. Also, the thing I don’t recommend you do at home is try to take pictures while field dressing. Your camera will hate you afterward. 1. Remove the feathers. Pulling them out in small bits while securing the skin with the other hand is the way to go. It prevents the skin from tearing. 2. Cut the wings at the first joint. 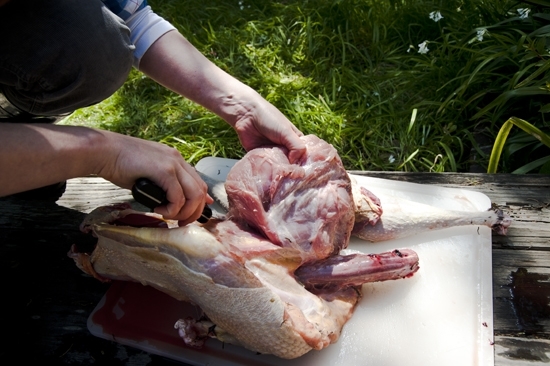 There isn’t much meat after the first joint, so it is best to cut the wings there once the bird has been well plucked to the tail. 3. Cut the tail right at the base but above the gland. It will begin to look like your Thanksgiving table right there before your eyes..
4. Cut the feet at the joint. You’ll need to bend them to find the break in the joint. These make a good table centerpiece or a nice wedding gift. Yes, I have at least two friends, why do you ask? 5. Remove the head at the neck. Leave yourself a lot of room by cutting high at the neck. There is a lot of meat on the neck that makes a great stew. 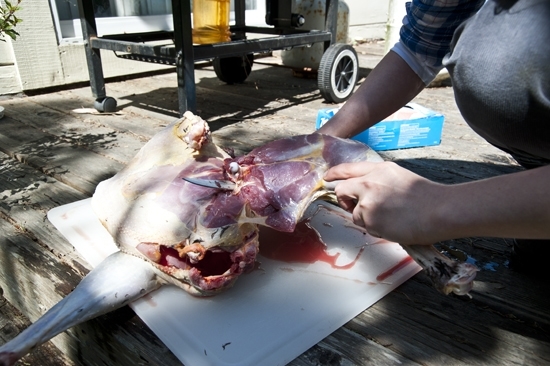 There is also bone there which means you’ll need a sharp knife to cut around the vertebrae. I would not recommend this has a wedding gift. It could be taken the wrong way. But it might make a good coffee table conversation piece. 6. Remove the insides. Cut a slit at the base underneath the tail. The opening should be about this size, large enough to fit your hand inside. Get your hand in there and pull it out in one handful. The area where the colon meets the tail will need to be cut out. 7. Separate the liver, heart and gizzard from the innards. You will have this interesting art piece once everything is out. 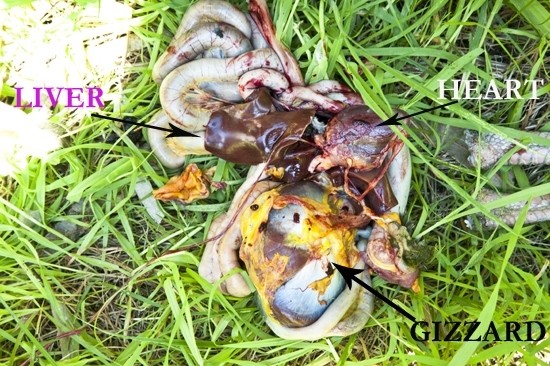 The gizzard, heart and liver are all edible and delicious. 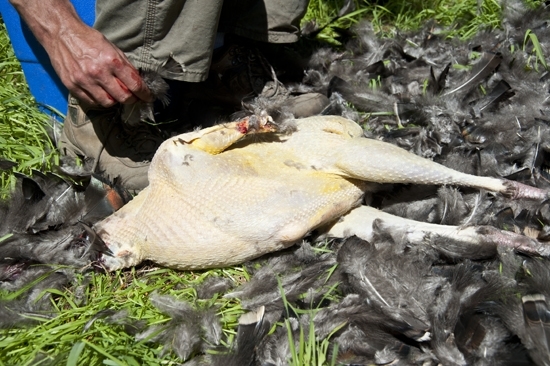 Do not waste, you worked too hard for this ol’ gobbler and he deserves that you respect every part of him. 8. Remove the crop. 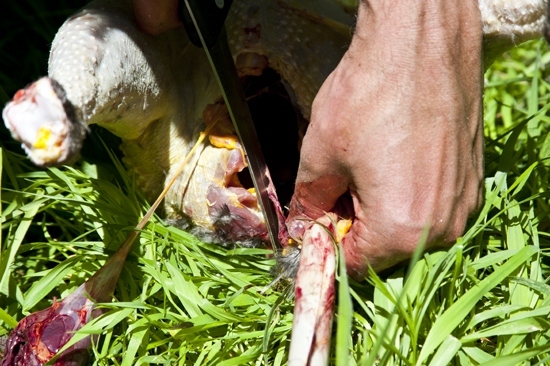 At the top where the neck meets the chest, you’ll need to make another slit and pull out the “crop,” which is the semi digested food from the turkey’s chest cavity. 9. Save the tail feathers. They are awfully purty. They make a nice headdress for cocktail parties. 10. Rinse the carcass thoroughly. I recommend a hose with good pressure to help you power wash the insides and remove excess blood and lung tissue. 1. Get yourself a good sharp boning knife. Okay, this one is not a good sharp boning knife, I just liked the look of it for the photo. Doesn’t it make me look fierce? 2. 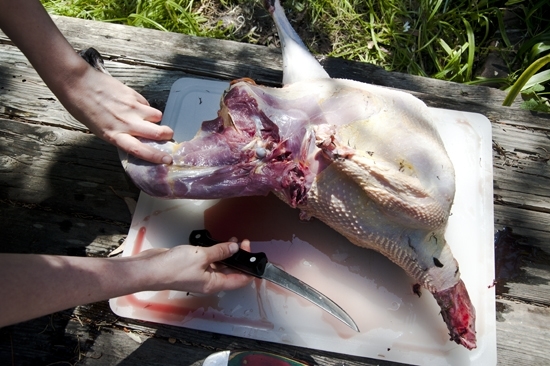 Set out a large cutting board and lay the turkey out. Make sure you have a place where the blood can run off and that can be rinsed easily later. 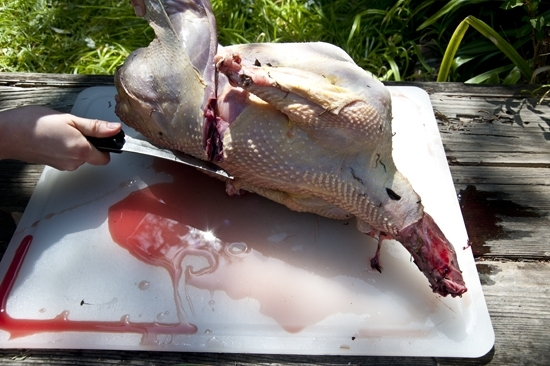 I recommend silicon for a cutting board since wood will absorb blood and bacteria. 3. Begin by cutting along the seams of the legs. There is a natural separation where the legs will come away from the breast easily. 4. Cut to the spine and around the oyster. There is a beautiful piece of meat on all birds called “the oyster.” It is round and sits at the spine at the top if the leg. It is easy to leave behind or ignore, but don’t! It is the best bite of the bird. 4. Pop the leg back to reveal the ball joint. This will help loosen the leg. 5. 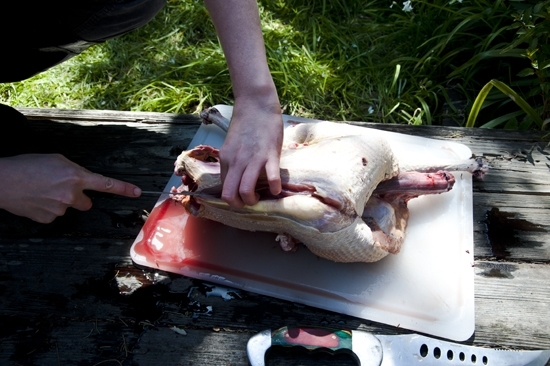 Use a sharp knife to remove the leg from the back spine where the oyster is, to the tail. Then repeat steps 3-5 with the other leg. I would like to interrupt our regularly scheduled programming to show you a mysterious man and his underwater spear fishing gear. 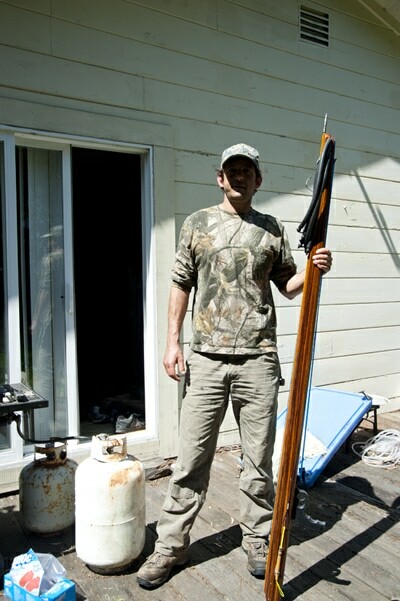 I thought you should know what a good abalone spear looks like in case you want to swim with the Great White Sharks of the Pacific. 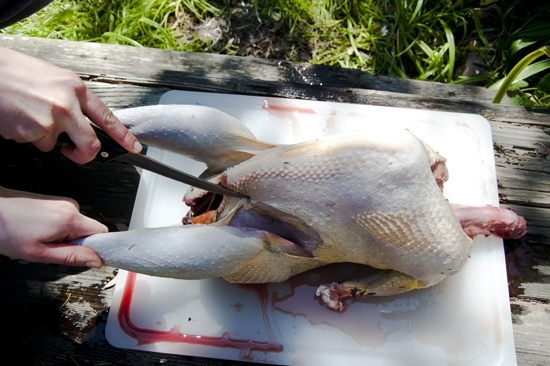 Keep your knife close to the breast bone as you slowly peel away all of the breast meat. When you get to the base cut it off. Repeat with the other breast. 7. Trim your parts. 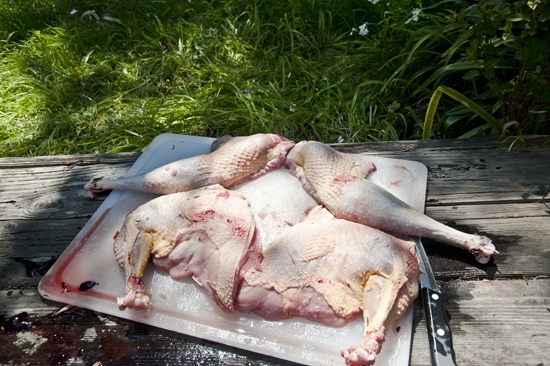 Now that you have four beautiful turkey parts, trim them of excess tissue and debris and give them another hose down. Then put them in storage bags. 8. Save the carcass for stew. There is nothing like a good turkey stew or even a simple stock. I have a turkey oyster stew recipe in my upcoming book that you’ll love, or you can try this turkey stock recipe, it’s liquid gold and freezes well. Whatever your adventure, wherever it may be, let it be a wild one. 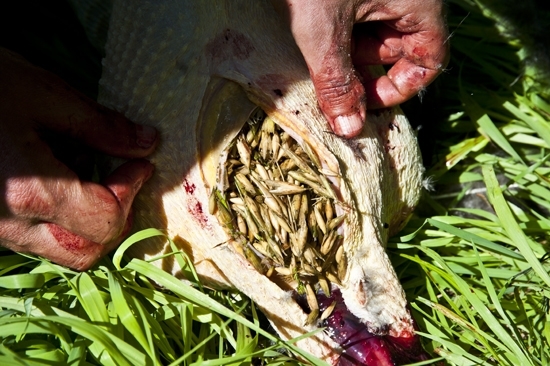 What are your turkey tips, do you have anything else to add here? Ha! Ha! I surprised myself and made it through the entire post without squinting. Very interesting and entertaining! Not sure I’ll do this any time soon but I’m certainly happy to have turkey butchering in my mental reference section. The knife doesn’t really make you look fierce. The big knife beats heck out of the Swiss Army Classic (key ring size). You say you wouldn’t recommend the head as a wedding gift? I guess I better check to see if the mailman has already picked up the mail today…. Seriously- great advice. I would assume this works well for pheasant, chukar, grouse, etc?? I’ve always just breasted those birds and taken the legs–and it seems like a lot goes to waste. Might have to give this a whirl. Great tips and demostration, very informative but I have one question, how would this process work on a bird as small as dove? I usually just grab the breast of the dove at the base or stomach and give it a pul and the entire breast comes out in one pull. the rest is just tossed, I am missing something on the dove besides the breast? they are so small I couldnot imagine that there would be alot of meat left in the legs/wings. oh yes you do look fierce with that knife! Thanks very much for telling us where the “oysters” are. I first ran across the term while watching the movie Amelie years ago, but never knew which part of the bird it was. I’ve roasted many whole turkeys and chickens, but never knew exactly which bit I was looking for. Now I know and dibs can be called. Awesome! Always call dibs on the oysters : ) Maybe share one of them if you’re feeling generous and want to convert someone. Ha! Yes, that’s a pretty impressive spear gun I agree. And I bet it’s interesting to use it with a snorkel attached to your face. I’m from Rockland too (lived in Sparkill and Piermont until 3 years ago) I’m wondering if you’ve ever hunted wild turkeys around here? as I’ve whole families living on my property, they really look like Thanksgiving. I’m from Sparkill and Piermont, I bet we’ve crossed paths, small world! Yes, there are tons of turkeys trolling around. My neighbor has 20 acres and allows bow hunting so I know people have harvested deer but I don’t think turkey. I may try that next. Glad this post was helpful! Thank you! Very informative and rather funny as well, and timely as well. We have a small flock of golden broad breasted and at least 3 are about to embark to the great beyond. Happy Thanksgiving and G-d Bless America! Great post Georgia. I can admit to being squeamish, but anyone (like me) who enjoys Thanksgiving turkey dinner ought to be able to know how this is done, and ultimately be able to do it themselves! I recently helped my pastor butcher turkeys but the meat was tough, what happened. We cut their heads and did every but the meat was as tough as shoe leather. 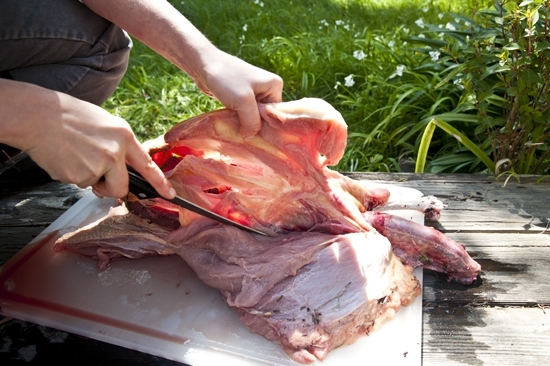 Butchering is one thing but then you have to brine or marinate them before cooking, which is another step all together. 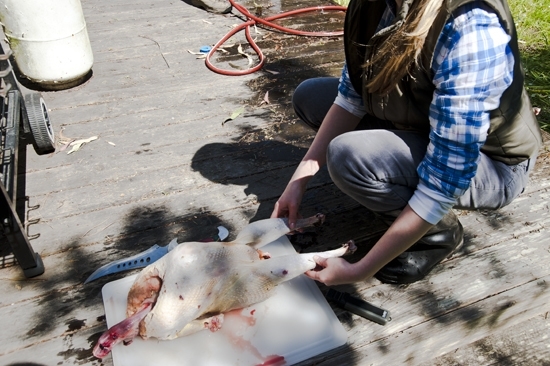 Take a look at my book “Girl Hunter” for some tips on how to cook them properly. Soak the turkey in buttermilk for several days. it will be tender and delicious when fried. 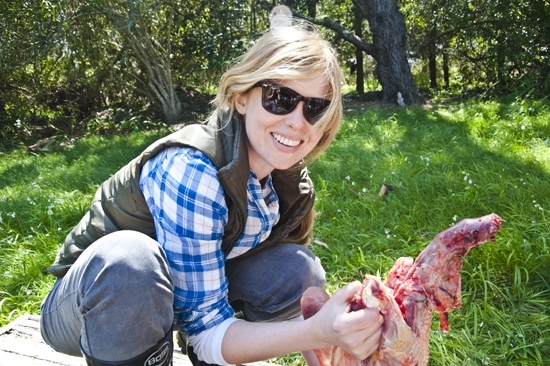 Smiling on my end….Live on a small farm and love to hunt.. 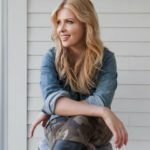 Your video was awesome and the next time, CAN’T wait to show the guys how to PROPERLY FIELD DRESS A TURKEY..and keep all the meat not just “tail” (seems to be their FAVORITE part) and breast… do you have a video on deer ? enjoy getting one up on the fella`s… we seem to differ on a few THINGS IN that area also… giggling… nothing like great funny hunting MEMORIES.. and the feet did mail pr to my dad yrs ago w/note. Love this step by step instruction and the sense of humor. We have recently moved from the Washington, D.C. area to the wild country of northern Idaho. My husband (who has run cattle and sheep ranches forever) has moved this city girl to the country and we have literally 100’s of turkeys everyday on our property. Would love to cook one for Thanksgiving. We have a bet….my husband says he will kill it, if I clean it and cook it. I think I just may be able to do this. I believe he questions whether or not I can really do it. I would love to prove him wrong. Gonna give it a shot. Why not just skin the bird whole ? Thank You Very Much. i wish i would have seen this earlier today when i was trying to butcher my turkey. i didn’t do even close to as good as you did. 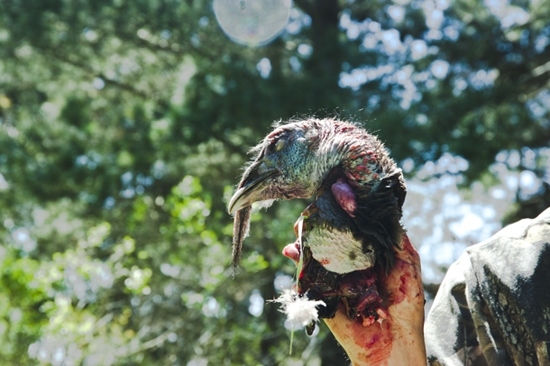 where can i get your book about turkey hunting? the web site below didn’t work. thanks, john c. nimmo sr.